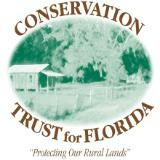 The mission of the Conservation Trust for Florida is to protect the rural landscapes of Florida. We focus on farms, ranches, working forests, and natural areas that provide landscape connections. Alachua County's "Emerald Necklace" initiative intends to create a protected network of trails, greenways and open spaces connected through several individual and adjacent projects. The Wood family recently finalized their dream of protecting their 172-acre farm in Evinston with a conservation easement that allows them to continue farming while also protecting a magnificent view and the shoreline along Orange Lake. *This figure includes land that has been acquired by land trusts -- whether through purchase, donation or by another means — and subsequently has been transferred to a public agency. It also includes land protected through other methods such as negotiating and preparing for acquisition by other organizations or agencies.